Wayne, Macomb and Oakland counties experienced decreases in the number of monthly building permits pulled. According to the most recent data provided by the Michigan Department of Technology, Management, and Budget, the unemployment rate for the state of Michigan decreased from 7.1 percent in October to 6.3 percent in December. 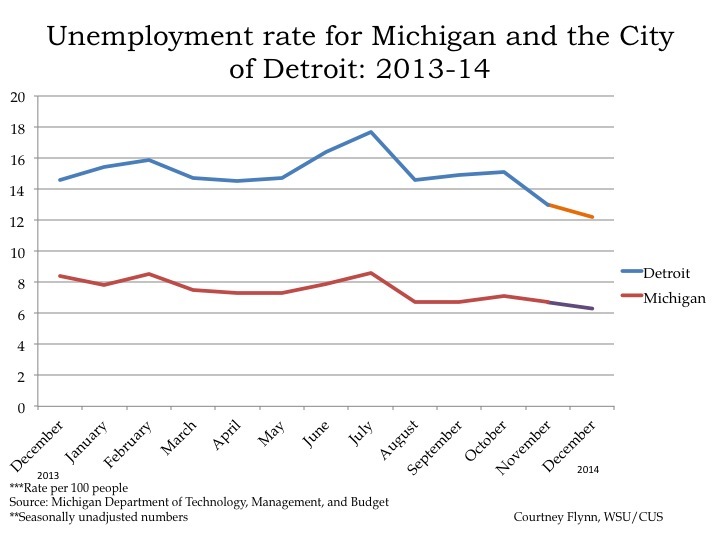 During this same period, unemployment in the city of Detroit also decreased from 15.1 in October percent to 12.2 percent. 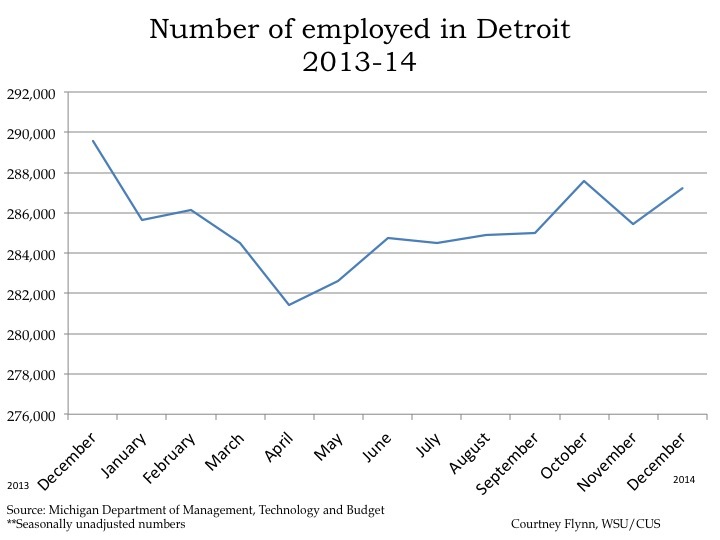 From November to December of 2014, the number of people employed in the city of Detroit increased by 1,775, leading to a total of 287,228 people employed in December. 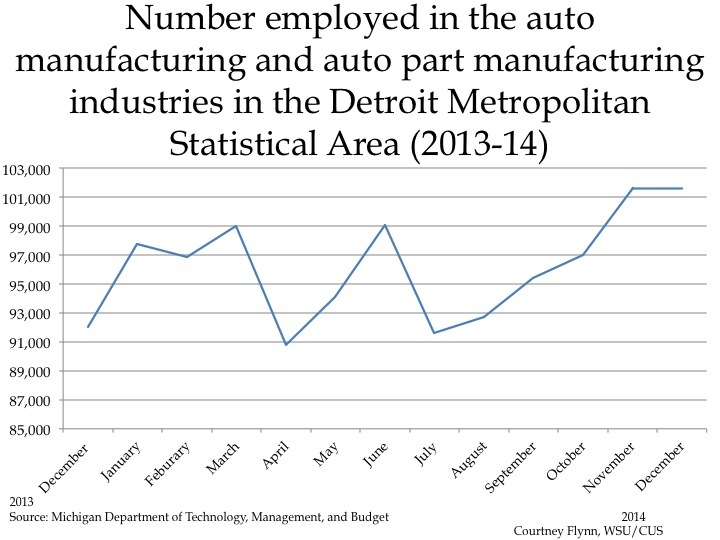 The above chart shows the number of people employed in the auto manufacturing industry in the Detroit Metropolitan Statistical Area (MSA) (Detroit-Warren-Livonia) from December 2013 to December 2014. From July 2014 to November 2014 employment in this industry has increased by 9,000 from 91,600 to 100,600. However, from November to December, that number stagnated, remaining at 100,600. This was still the highest it had been over the last year. The Purchasing Manger’s Index (PMI) is a composite index derived from five indicators of economic activity: new orders, production, employment, supplier deliveries, and inventories. A PMI above 50 means the economy is expanding. 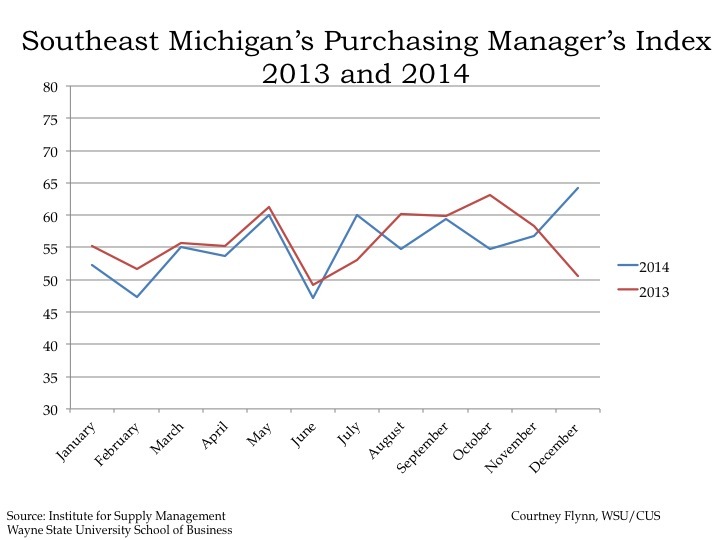 According to the most recent data released on Southeast Michigan’s Purchasing Manager’s Index, the PMI for December 2014 was 64.2, an increase of 7.4 points from the prior month. 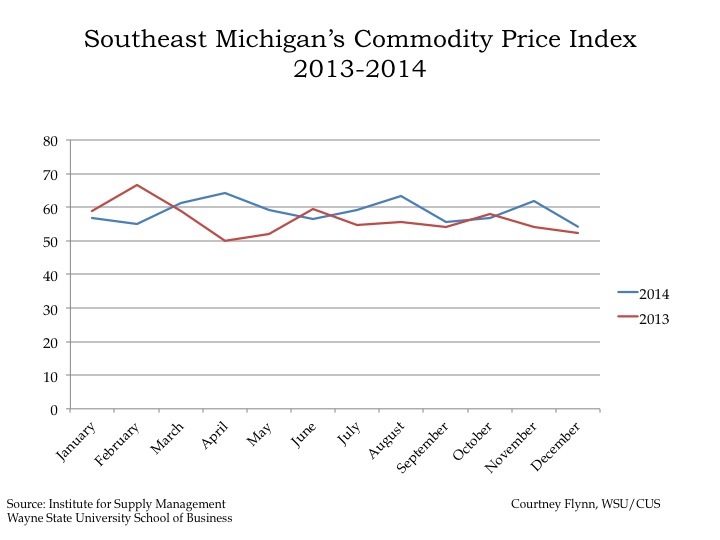 As compared to December 2013, there has been an increase of 13.6 points. The Commodity Price Index, which is a weighted average of selected commodity prices, was recorded at 54.2 points in December 2014, which was 7.6 points lower than the previous month and 1.9 points higher than December 2013. 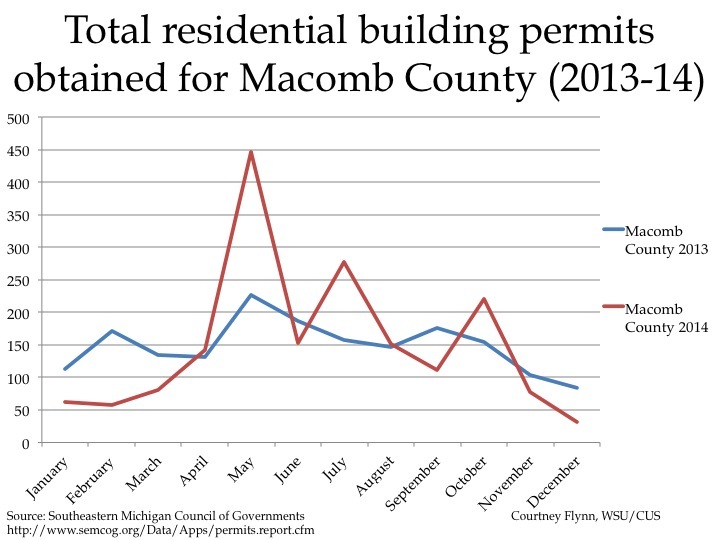 The above charts show the number of residential building permits obtained each month in Oakland, Macomb, and Wayne counties from January 2013 until December 2014. These numbers are reported by local municipalities to the Southeastern Michigan Council of Governments and include single-family units, two-family units, attached condos, and multi-family units. Oakland, Wayne, and Macomb counties all experienced a decrease in the number of building permits pulled from November 2014 to December 2014. These declines are largely seasonal, due to weather. 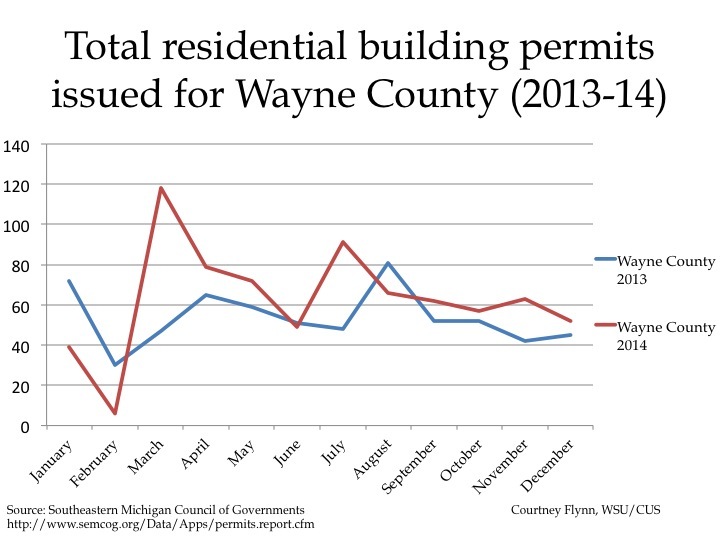 Only Wayne County issued more permits in December 2014 than it did in December 2013. 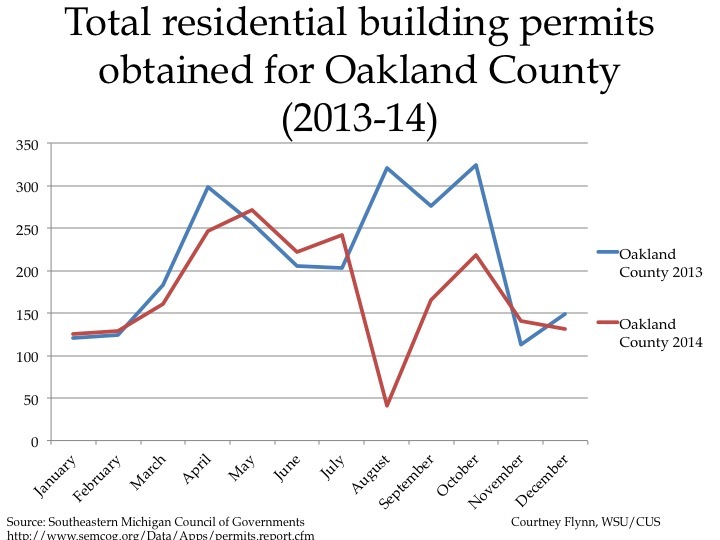 Oakland County issued 131 permits in December of 2014, a decrease of 10 compared to November 2014 and a decrease of 18 compared to December 2013. Macomb County issued 31 permits in December 2014, 47 fewer than in November 2014 and 52 fewer than in December 2013. Wayne County issued nine fewer building permits in December than November of this year; in total 52 permits were pulled. This is seven more than the number pulled for the county in December 2013.